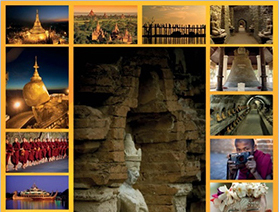 Myanmar Shalom is proud to introduce the mystifying and ancient city of Bagan. The city is one of the main tourist destinations in Myanmar and one of the most remarkable archaeological sights in Asia. The magic of Bagan has inspired visitors to Myanmar for nearly 1000 years. One of the main highlights of Bagan is the sunset. Myanmar Shalom will take you to the top of a tall pagoda where you can go back in time as the sun sets behind the mountains that sit along the river.